KEGUMS (LATVIA), 26 June 2010 – After the 2011 FIM Motocross World Championship provisional calendar was published on Thursday, Youthstream looks forward to a more globalized future and continues to show interest in the Asian market. With the FIM Asia President, Mr. Stephan Carapiet, attending the Latvian GP this weekend with top Asian rider Tomoya Suzuki, Youthstream could continue the negotiations for a future Grand Prix in Asia. 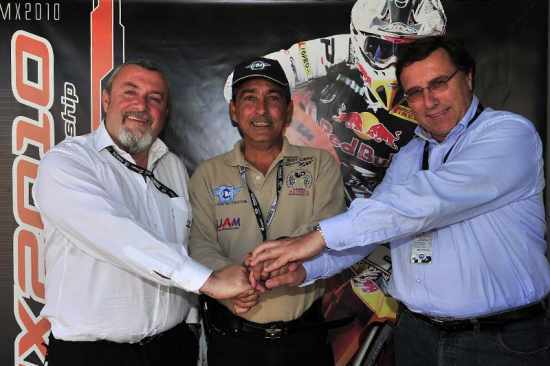 This remains a key area in the globalization plan of the FIM Motocross World Championship, which will offer its partners a solid worldwide stage from 2011. After a journalist misinterpreted Youthstream’s 2011 provisional calendar, we would like to make some clarifications. With the opening round set for May 15 in Australia, the series also includes one round in Brazil and two rounds in the USA. The remaining 11 rounds will be held on the European continent with the provisional calendar still being finalized. In The Netherlands Youthstream has always dealt with two big professional organizers in the likes of Valkenswaard and Lierop and wishes to continue cooperating with both of them. Youthstream is still to decide if the Grand Prix of The Netherlands will be alternated between the two venues or if an extra Grand Prix will be inserted into the calendar. The venue for the Grand Prix of Italy will be announced by October. This is because, like every year at this moment of the season, the Italian Federation and the local promoter (DBO) are still exploring the best possible venue. France, instead, will take a one year break from hosting Grand Prix events because the country was given the best event of the year, the Motocross of Nations, and we would like to concentrate all efforts on the MXoN. From 2012 France will be back on the Grand Prix calendar. After a break in 2010 we will be back in Great Britain in 2011. There are two possible locations: Chepstow or Matterley Basin. The Grand Prix in Glen Helen is scheduled on the second weekend of September due to a gentlemen’s agreement between Youthstream, AMA and the AMA Nationals Promoter (MX Sports). This gentlemen’s agreement stated that the GP events in the USA would be organized after the AMA Nationals finished (and that traditionally happens on the first weekend of September). As the provisional FIM Motocross World Championship calendar shows, Youthstream has fully respected their agreement but feels free to change the USGP schedule in case the agreement is not respected by the other two parties. For the second round in the USA, Youthstream is still dealing with three organizers who have shown their big interest in holding a GP in the 2011 FIM Motocross World Championship. This will be announced at the Red Bull FIM Motocross of Nations in Denver this September. The final FIM Motocross World Championship calendar will be published by the FIM after the FIM Congress in October 2010. In conclusion, Youthstream is pleased to be organizing such an amount of worldwide events and at the same time have an important list of organizers showing interest in the FIM Motocross World Championship.